Looks like we're in for a summer of discontent, with strikes ahoy in various sectors. 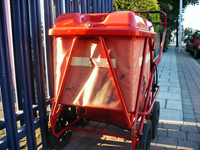 Most visibly, the postal workers of London will down tools again on Friday in protest against staff cuts, increased workloads and 'bullying managers'. Royal Mail say they'll do everything they can to minimise the effects of the strike on customers. Upon sharing a witticism with the Londonist postie this morning, we were warned that repeated gags about getting the 'sack' would lead to a special delivery of a fistic nature, with a first class stamp. Meanwhile, lecturers at London Metropolitan University walked out yesterday in an ongoing effort to prevent redundancies. The third strike in eight weeks at London's largest university saw a rally on Whitechapel Road to save over 500 jobs. Finally, more bad news for print journalism, as workers at the Guardian's printworks hold a ballot for industrial action. Guardian News & Media group want to shed a third of their staff via voluntary redundancies, but with just a few days until the deadline for application, no one has come forward. If a strike goes ahead, the printworks in Stratford could completely shut down, limiting circulation in the south-east. With rumblings of industrial action from BA staff and firefighters, and the ever-militant Bob Crow stirring up taxi drivers, we could be in for a long summer of not very many things working.